This busy terminal located in New Haven Harbor has multiple cranes that are capable of handling up to 50 tons. The cranes are powered by diesel generators that can operate 24 hours a day when the cargo arrives. 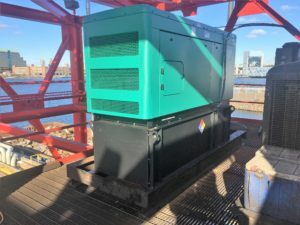 Tower recently did a midlife rebuild for one of the generators and we were also contracted to replace a generator that had exceeded its life expectancy. Tower designed and fabricated a new base that we welded in place on the crane platform. The new genset is in place and this crane is now back to work. To supply power to the critical crane operations at the port so that the cargo ships can meet their scheduled arrivals and departures.